It is difficult not to agree with Hitchcock’s opinion that casting was one of the major faults with Saboteur. The same script shot with Gary Cooper and Barbara Stanwyck would have been an altogether different experience. The film is essentially an American re-imagining of The 39 Steps, but with more overt political undertones (or overtones). …Hitchcock, along with Joan Harrison and Michael Hogan, developed a treatment for the Selznick picture. Their tale about a California munitions worker falsely charged with sabotage resembled The 39 Steps; the hero’s search for the actual turncoat included a love interest, several humorous and suspenseful episodes, and the dynamiting of a new dam to be opened by the president of the United States. While one cannot argue that there are flaws in the film’s construction, these flaws weren’t helped by the writers that Selznick chose to help Hitchcock fix these issues. Selznick was both unimpressed, and uninterested in making the film. However, he knew that he could make a nice profit by selling it to another studio. It was up to Alfred Hitchcock to sell the project if he wanted to make the film, and after being rejected by several studios (including Twentieth Century Fox and RKO), independent producer Frank Lloyd bought it. 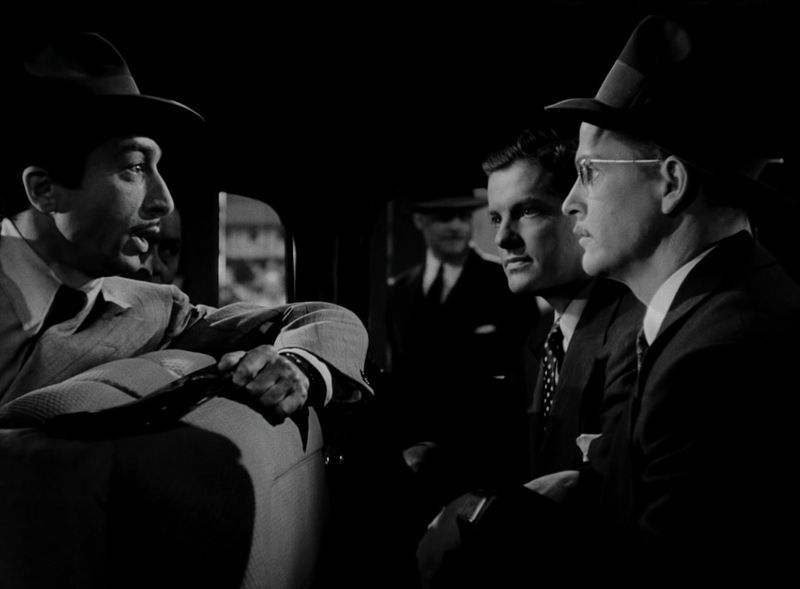 Hitchcock was glad to be away from Selznick, and Selznick was satisfied with his 300 percent profit. Apparently, it is quite lucrative to be a Hollywood talent-pimp. Leff paints a slightly more negative critical reception than the film actually received. Most critics found plenty of things to admire in Saboteur, but laced their compliments with negative reservations. One could best describe reception of the film as “mixed.” On April 29, 1942, Variety wrote a review of the film that set the tone for reviews to come. “All the typical Alfred Hitchcock cinematic wrinkles are present in his newest picture, Saboteur, which he has made on a Selznick loan out for Universal release. It is violently typical Hitchcock. It has the same basic elements of chase melodrama, the romantic couple beset by sinister forces they only partly see and dimly understand, the complicated plot, fantastic situations, colorful minor characters, sardonic comedy touches and sudden, wild climax. It’s expert and enormously effective. It’ll get rave reviews, play holdover engagements and clean up at the box-office. As Hitchcock continues to turn out pictures his methods become increasingly familiar and recognizable. For he is a vivid stylist whose stamp is unmistakably on every film he makes. It doesn’t matter at what studio or with whom he works. If Hitchcock directs it, it’s a Hitchcock picture. In a way, that’s a supreme compliment, for nearly every film he’s made in recent years, whether in England or Hollywood, has been an outstanding critical and box office success. Nevertheless, it indicates a lack of versatility, since all his pictures tend to be similar, not only in type of story, but in the technical tricks by which he gets his effects, in the unvarying expression of his creative personality. Of course a great deal of criticism came from the pretentious plausibility seekers that have no appreciation for Hitchcock’s special kind of fantasy. Bosley Crowther was always such a critic, and his review for The New York Times followed suit (even if it was veiled in condescending praise). “…To put it mildly, Mr. Hitchcock and his writers have really let themselves go. Melodramatic action is their forte, but they scoff at speed limits this trip. All the old master’s experience at milking thrills has been called upon. 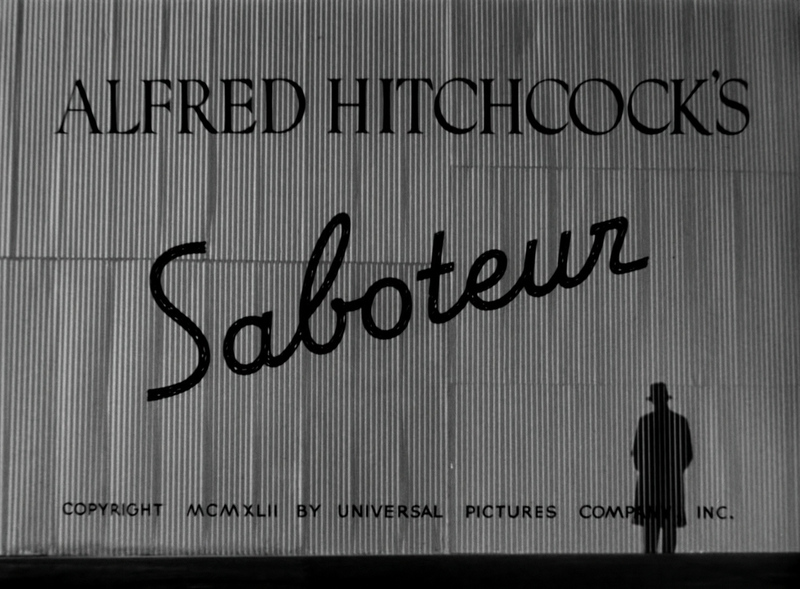 As a consequence—and according to Hitchcock custom—Saboteur is a swift, high-tension film which throws itself forward so rapidly that it permits slight opportunity for looking back. And it hurtles the holes and bumps which plague it with a speed that forcefully tries to cover them up. …So fast, indeed, is the action and so abundant the breathless events that one might forget, in the hubbub, that there is no logic in this wild-goose chase. Actually, there is no reason for the hero undertaking his mad pursuit, since the obvious and sensible method would be to have it conducted by the FBI. Consequently, one wonders—if one stops to wonder at all—why the hero is in such a dither as to his personal relations with the police, why—at any juncture—he shouldn’t hand the job over to the cops. This possible intrusion of one’s reason might therefore tend to drain some of the harrowing tension from many of the tricky episodes. Particularly in the one sequence, where the hero and heroine seem to be coerced to silence at a party of innocent folk, one wonders why a word to a near-by general or admiral wouldn’t do to put an end to their peril. And how was a bomb ever set in the navy yard. As usual, Mr. Hitchcock and his writers have contrived excuses. But their casual presentation of the FBI as a bunch of bungling dolts, their general disregard of authorized agents and their slur on the navy yard police somewhat vitiates the patriotic implications which they have tried to emphasize in the film. One gathers that the nation’s safety depends entirely on civilian amateurs. Readers might notice a pattern of reserved praise in the reviews of Saboteur. This pattern continues in a review published in The Times. Everything in the review expresses admiration, but this is only after announcing to the reader that Hitchcock is repeating himself. “Mr. Alfred Hitchcock does not attempt anything startlingly original in Saboteur. He is content to take the old counters in the game of sabotage, flight and pursuit, and his interest, and that of the audience, lies in the cinematic pattern he makes of them. Today Saboteur is seen as “second-tier” Hitchcock, and this reviewer is very much in agreement with this opinion. However, the film is not inferior because it is another “chase film.” There were a number of unfortunate handicaps placed upon the production, as Donald Spoto relates in his essay about the film. Since the government placed budget and set constraints upon the production, a number of cheaper B-movie alternatives were used to get Saboteur over this hurdle. It is also likely that Selznick’s apathy towards the project in the production’s earliest stages damaged the script’s development. In fact, final analysis finds this reviewer disagreeing with Hitchcock’s claim that “the picture was overloaded with too many ideas.” The real issue was that these ideas were not developed and executed as well as some of his other features. 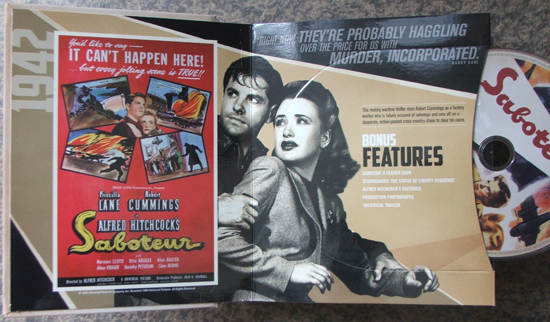 Saboteur’s 1080p image transfer is one of the best offered in Universal’s Hitchcock catalog. One might be alarmed at a bit of noise and film damage during the opening credits, but these issues disappear after this sequence. The rest of the film is beautifully rendered, and Joseph Valentine’s photography shines with fine detail that was never seen in DVD transfers of the film. While brightness occasionally fluctuates, this is inherent in the aged film prints. The transfer is only as good as the source prints, and this fluctuation is never distracting. Blacks are deep and inky, and enhance an image that already contains excellent contrast without losing any detail. Mid-range grays are perfectly gorgeous, and balance the image nicely. A fine layer of grain betrays the film’s celluloid source and provides a cinematic atmosphere. This is the best that the film has looked on home video. This two-channel DTS-HD Mono track should please the purist, and impress audiophiles that respect fidelity to a film’s original soundtrack. Saboteur has never sounded as clean and clear as it does here. Distractions such as hiss never become an issue on this transfer, and dialogue is always intelligible. One can hear sounds that weren’t quite clear in DVD issues of the film. It is nice to see that the audio was given the same amount of respect that was afforded to the image. This excellent documentary short directed by Laurent Bouzereau was originally included on Saboteur’s first DVD release. This was back in the day when special features offered audiences more than short pieces of fluff that do not amount to anything more than a waste of the viewer’s time. The documentary offers the viewer a glimpse at the film’s production, relying heavily on two interview participants. The first of these participants is Norman Lloyd (actor), and the second is Robert Boyle. 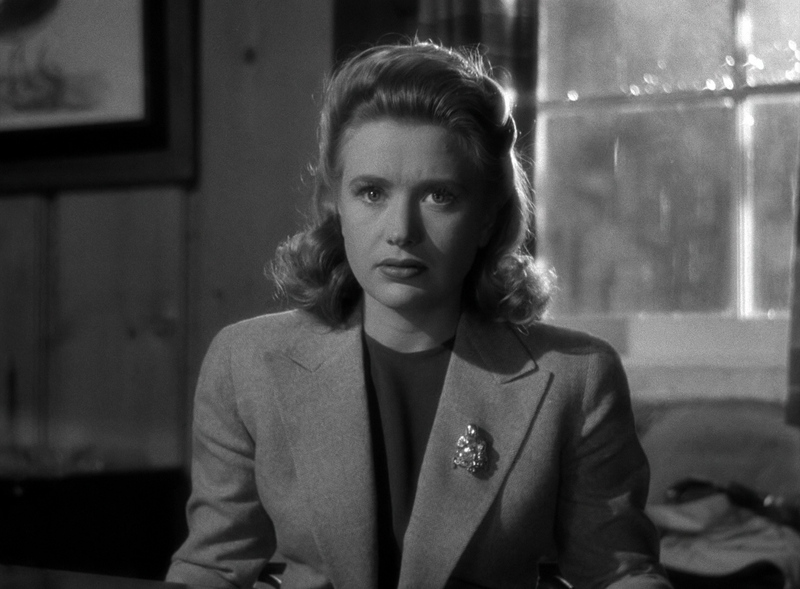 Patricia Hitchcock is also here as a secondary source to fill in a few holes, and archive footage of John Houseman allows him to make an appearance. This program isn’t quite as comprehensive as Bouzereau’s excellent feature length documentaries about Psycho and The Birds, but it is a significant look at the film that renders additional supplements almost gratuitous. It would be very difficult to add anything significant to what is relayed in this piece. Saboteur’s trailer is actually rather interesting. 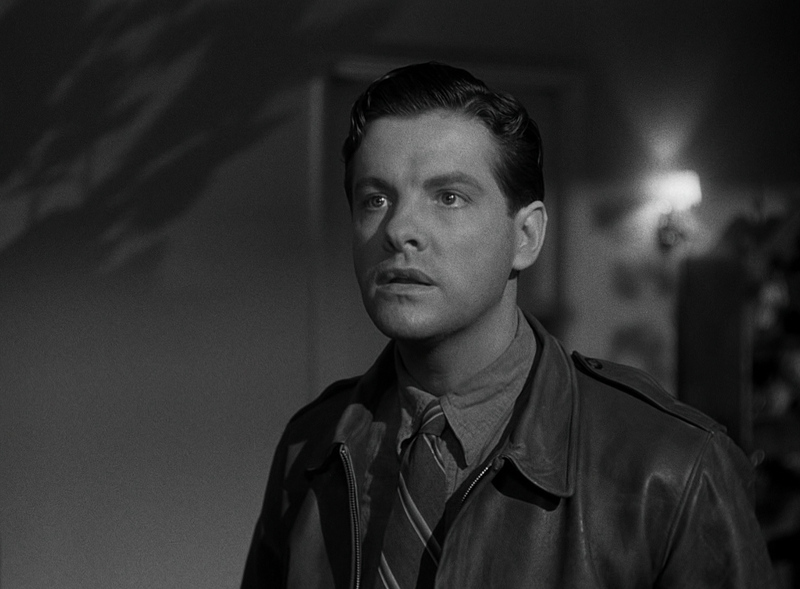 While it is not as creative as those for Hitchcock’s later features, it is more than a mere series of clips from the film. 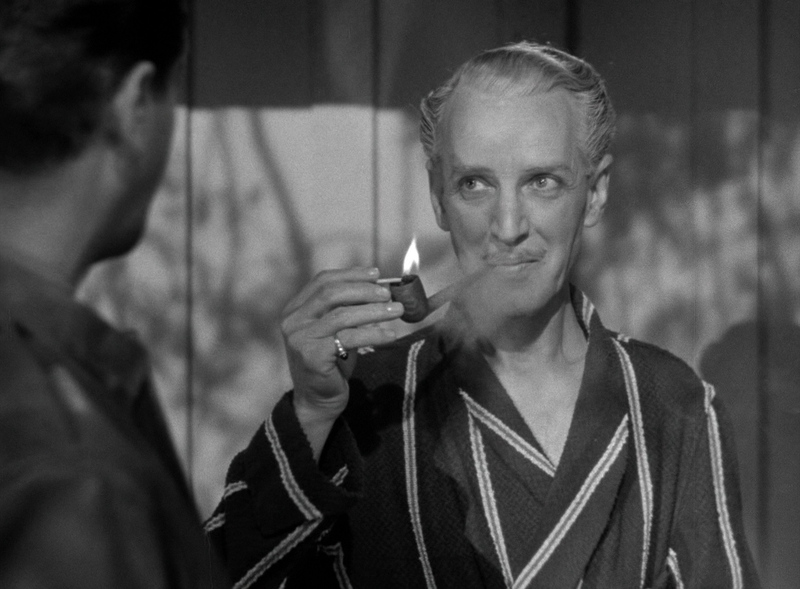 Barry Kane (Robert Cummings) hosts the trailer in much the same manner that James Stewart hosts the trailer for The Man Who Knew Too Much (1956). It is very nice to have this included in the collection. 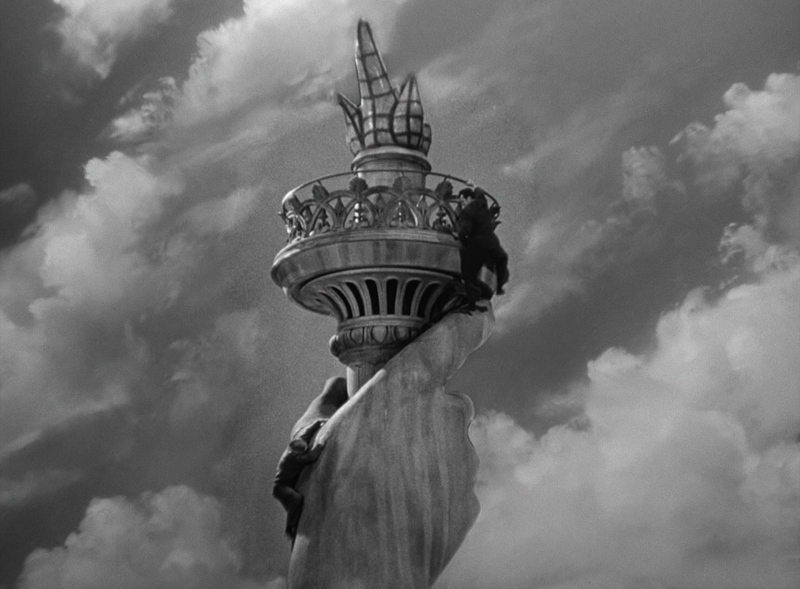 Universal has also seen fit to provide viewers with a gallery of storyboard drawings for the Statue of Liberty sequence. This should delight fans and film students. A selection of drawings and storyboards by Alfred Hitchcock were used to help Robert Boyle in the production design, and some of these are included on this disc. They make an excellent companion to the other storyboards included here. This photo gallery includes movie posters, vintage ads, and production photos. These images are often a very interesting glimpse at the marketing of the film. 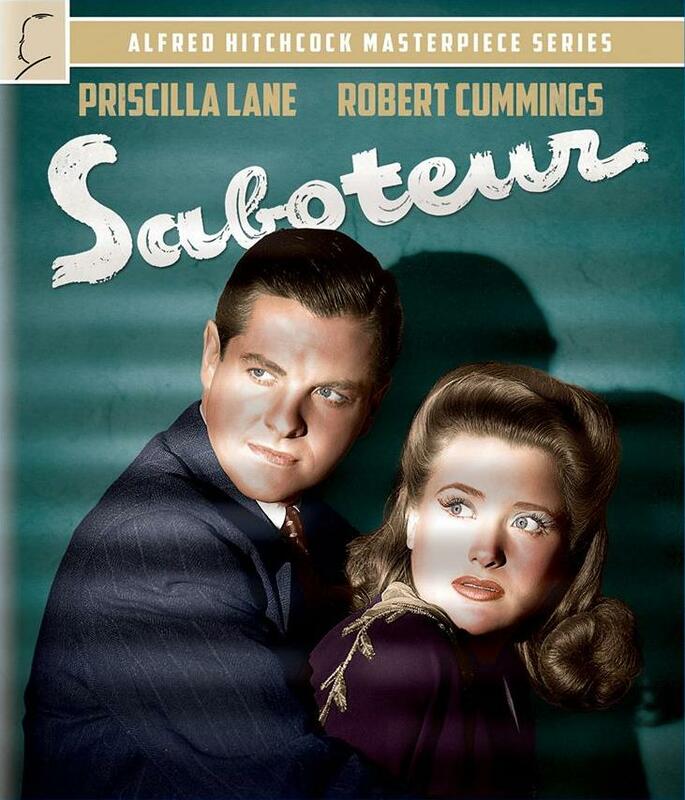 Saboteur is “second-tier” Hitchcock, but it is also first-rate entertainment. While casual fans may not wish to add this film to their collection, it should certainly be worth a rental for anyone who hasn’t seen the film. Those who do wish to add this Hitchcock film to their collection can rest easy in the knowledge that the disc exhibits an excellent picture and sound transfer.